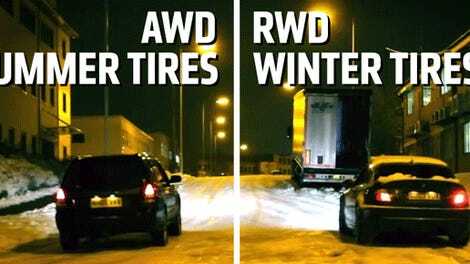 Anti-lock brakes are a godsend for everyday driving, but what happens when you’re driving on a snow-covered road this winter? Does ABS actually help you stop any better? Well, it does and it doesn’t. It turns out you do need some technique. The trick, as Team O’Neil Rally School founder Tim O’Neil explains, is to brake as softly as you can get away with. 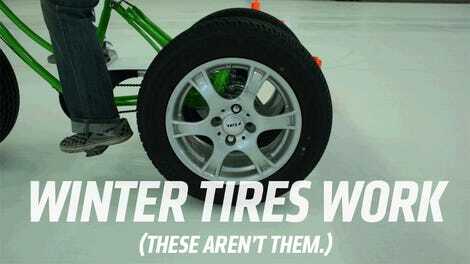 Triggering the ABS keeps your wheels from locking up, but that doesn’t necessarily make you stop any shorter on a very loose surface like snow. where N is the normal force (basically any forces pushing an object toward the ground- weight, downforce, etc.) and mu is the friction coefficient. Static friction coefficients are larger than coefficients of kinetic friction. When you hit the brakes on your car, you therefore want your vehicles to roll to a stop so as to ensure that the wheels are slowing down due mostly to static friction (also called rolling friction), not purely kinetic friction (sliding friction). This often maximizes the friction force and can decrease stopping distances, especially on paved surfaces. A standard Anti-lock Braking System uses four wheel speed sensors, a hydraulic pump, four hydraulic valves (assuming it is a 4 channel setup), and a controller. The controller in the ABS system monitors the speed of each wheel using the wheel speed sensors, which are usually hall effect sensors. If the controller sees that one wheel is decelerating at a rate that couldn’t possibly correspond to the vehicle’s rate of deceleration, it actuates the hydraulic valve in that wheel’s brake line to reduce the brake pressure applied to that wheel. This allows the wheel to turn faster. Once the wheel is back up to speed, it uses the pump to introduce the pressure back into that brake line, applying that brake again. When the controller sees rapid deceleration again, it activates the valve and the cycle repeats about 15 times per second. All of this is to say that ABS monitors your wheels to detect if they’re locking up and loosens up on the brakes until they’re rolling and slowing normally. On pavement, that’s great. On snow, you need some finesse. That is, as Tim puts it, the softer the surface, the softer you brake. This is at least true with an ace New Englander rally driver like Tim O’Neil behind the wheel. For me, this seems like one of those things I’m going to have to practice in a parking lot a couple times before I feel confident I won’t b-line into a tree.